Notes: Randall Kaufmann developed these first of these nymph patterns around 1973. Rubberlegs were added to his patterns in the early 1990's. Pattern colors can be brown, olive, tan, golden, and black. Kaufmann developed the pattern mainly to represent the Golden Stonefly, Calineuria californica, and the Salmonfly, Pteronarcys californica which inhabit freestone streams and rivers. During the early summer months, the nymphs tend to crawl towards shore and often become adrift within the current. During this period of time, the trout key on the stonefly nymphs as an excellent food source. 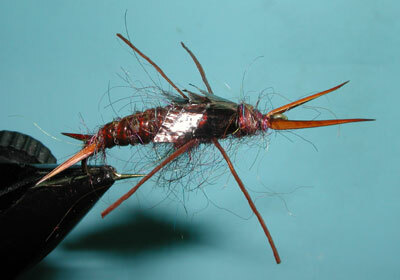 Kaufmann uses a complex blend of dubbing in all his stoneflies. This is important to instilling a lifelike quality to the flies. Blended dubbings are available known as Kaufmann Blends, available in Golden Stone, Brown, and Black. 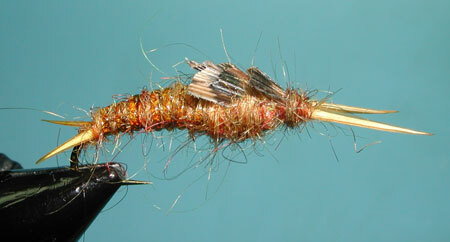 For the Salmonfly, Pteronarcys californica, Kaufmann suggested tieing the pattern on a TMC 300 hook sizes 2-6. This is a 6XL, heavy wire streamer hook with a straight shank. Some tiers will bend the shank after the fly is made to give a curved appearance, others have used a TMC 200R hook instead. I prefer the 200R as bending the hook will weaken it after it's been tempered. Since there are many black and brown stoneflys that are smaller than the Salmonfly, these pattern colors can also be used on hook sizes, 8-12. The Golden Stone, Calineuria californica , is a dominant stonefly throughout the Sierras. 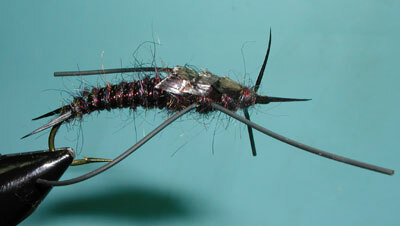 These nymphs are considerably smaller than the Salmonflies and Kaufmann suggests using the TMC 300 or TMC 5263 ( a 3XL Heavy wire Nymph hook) sizes 8-12. Again, the TMC 200R in the same sizes can also be a good alternative. The wingcases have traditionally been Turkey Tail sections in which the section is treated with a lacquer, flexament, or fixative to keep from splitting. I also like to use the Medallion sheeting product by Hareline. It's tough, easy to work with, and has a natural looking sheen similar to the actual wingcases. Three wingcases cover the thorax region with the first wingcase positioned so that the points of it meets the halfway postion of the body. The last wingcase needs to be placed so that there is just enough room to create a head. The last component of the Kaufmann Stones that you might have a problem finding is the Swannundaze ribbing that Kaufmann has suggested in his earlier books. This was a popular synthetic ribbing during the 70's and 80's but has been replaced with more stretchable products such a V-Rib, D-Rib, or Stretch tubing. The natural stoneflies have 10 segments on their abdomen, so you wrap the ribbing with closely spaced wraps so that there is 6-7 wraps showing on the lower half of the nymph. Turkey biots are suggested by Kaufmann for both the attennae and the tails. I suggest using the Goose biots for the tail since they are broader and thicker, much like the naturals. The lengths of the tails should be about the hook gape, so Goose biots will be plenty long enough. The antennae should always be the Turkey Biots, however. These should be half the shank length in size, which is a length easily accomplished with the Turkey Biot. They are also thinner and more supple to better imitate the natural than Goose Biots. Beadheads have also been added to this pattern since the 1990's. It's a heavily weighted pattern that probably doesn't need the additional weight of the bead. However, the bead does give the nymph a degree of flash and attraction that might improve the fishability. Salmonfly nymphs will inhabit the stream for 2-4 years and migrate once the water warms to about 50 degrees. The migration will start on the lower reaches of the stream and will work upstream. The nymphs will move during the late afternoon and early evening from the riffles to the shallows and eddies of the shore. During the night, they will crawl onto the rocks and foliage along the stream to emerge from their shucks.During this 4-5 day migration, nymphs often become dislodged into the current. Use a drag-free drift along the feeding lanes. The fly needs to have enough weight to bounce along the bottom.